Any parent or teenager not thinking very hard about this list is putting themselves at a severe disadvantage. And a lot of the jobs will surprise you. Being a waiter at a restaurant is remarkably resilient because the robots required to move around quickly, juggle lots of food, make quick adjustments, read peoples’ temperaments, attitudes, etc., and adjust accordingly—those are not skills that will come cheap to restaurants any time soon. But few people are making much money being a waiter, so it’s not necessarily a job to look forward to as someone in high school, or as a parent of someone in high school. Same with being a low-end medical person, like taking care of the sick and elderly. 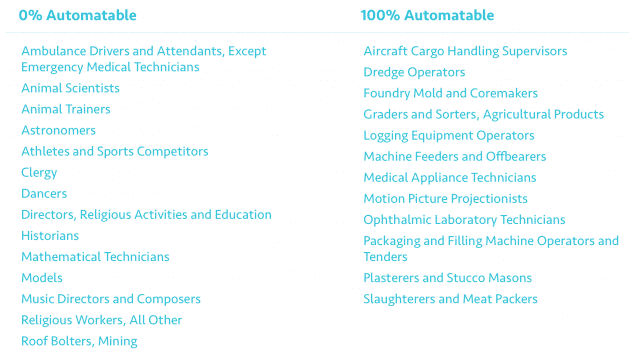 That’s not easy to replace with automation, and we’re going to need LOTS of these people, but it also won’t pay much money at all, or command much respect. Then there are tons of jobs that command lots of respect, but that are based on pattern recognition, like Radiologists, and Stock Traders, and Investment Bankers. Looking at radiology films, images of potential skin cancer, etc., are skills that took 10-15 years to master in the past, and hundreds of thousands of dollars in schooling to qualify for. So people who could do it made lots of money. But now they’re being beaten at their game by algorithms. There are numerous examples now of algorithms finding issues in radiology films, identifying cancer, making better stock trades, etc., than the best humans in the world. Importantly, when you improve an algorithm, you just copy it over and it works for whoever’s using it. You can give it to one or 1,000,000 people simultaneously, because it’s just technology. High-end humans are hard to create and hard to replicate. It takes a lifetime, tons of money, and lots of luck. The tech is going to win that race, and it already is. And that’s with them entering the game just a few years ago. If you want to stay employable, and highly valued, you should be thinking about what is hard for AI and/or robots to do. This won’t keep you safe for decades, but it might protect you for the next 10-20 years at least. After that, it’s hard to say what won’t be vulnerable to automation. If you care about someone’s future, make sure they understand this issue. Don’t let people you care about chase money right into a brick wall built by smart robots. The referenced piece can be found here.